Last year, The Humanitarian OpenStreetMap Team kicked off work to analyze OpenStreetMap (OSM) for the fight against malaria. Our goal is to provide organizations and communities the best tools to conduct analysis of OSM data in order to build a complete picture of baseline health infrastructure. 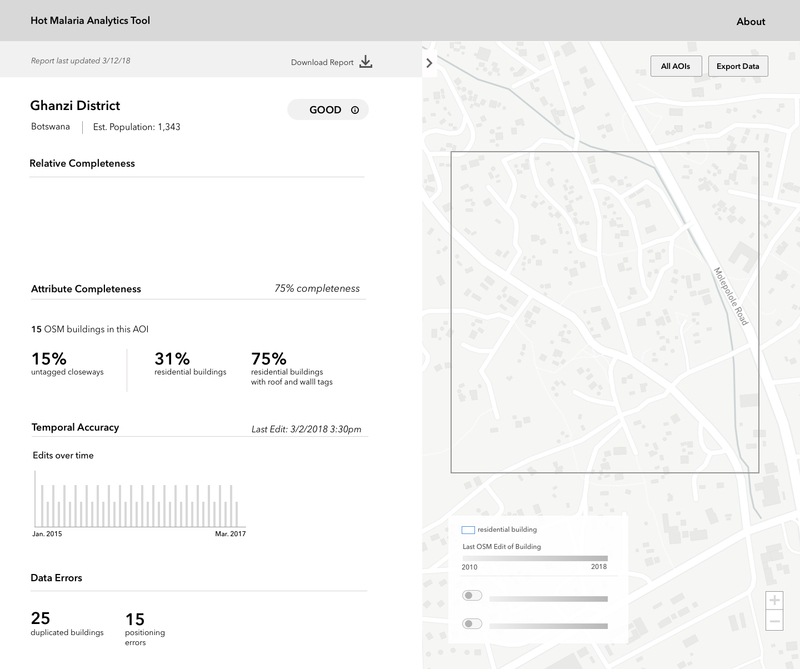 With our partners Development Seed and Azavea – we have started building an OpenStreetMap Analytics tool Health Module that will move us towards that complete baseline view. Malaria transmission occurs around the world with nearly 3.2 billion people at risk of infection. Global efforts to combat malaria have focused on targeted programming within areas that still see high transmission and getting the right resources in the right place. Knowing when and where to deliver services are a key part of effective vector control. To best guide efforts, we need to put all communities on the map. HOT is working to support partners in creating baseline data in OSM, because underpinning all effective malaria prevention campaigns is accurate geospatial data. But how good is OpenStreetMap…really? Attribute Completeness: How detailed is the data? Are the attributes relevant or complete to support malaria programming? Temporal Accuracy: What is the freshness of the data? When was the data last edited? Logistical Consistency (Positional Accuracy): Does the data obey logical rules, such as a structure should not be in water? Duplicative Data Errors: Do data points within the same dataset that refer to the same structure? For example, are there overlapping buildings? Geographic Coverage: Does the coverage of OSM match reality? Is the an area of high population have good coverage within OSM? Quality assessment work is the next phase in providing real tools to ensure the freshness, accuracy, impact, and community of OpenStreetMap data. The next couple of months will be full of OpenStreetMap analysis frenzy. This Spring we’ll see the first phase of software development complete. Over the next few weeks, we will build out the infrastructure for processing and a web frontend for interacting with the results. Parallel to this project is a new field data collection project in Botswana. Working with the Ministry of Health’s National Malaria Control Programme and the Clinton Health Access Initiative, HOT will be conducting a building assessment across five districts in northern Botswana. This will be a complete assessment and gives us the chance to test and improve how the Health module can support field work. Look for updates on the results in late May as we reach a midterm point in the data collection. A first look at how a report will look. And starting in the summer you can find us at events facilitating further discussion. Are you going to FOSS4G? Drop us a line if you’d like to be directly involved in testing, conferences, discussions, or more. The future direction of OpenStreetMap Analytics platform is shaped by the constant flow of code contributions and funding directed towards the implementation of new features. If you are interested in supporting ongoing development of the platform including development of the roadmap, please reach out to us directly at slack.hotosm.org or on Twitter. Please join us in the OSM Analytics slack channel at slack.hotosm.org to stay involved!